By favor of popular demand and common consent among pugilists "Tom" Cribb, the Quld Champion," was allowed to hold the title long after his fighting days had passed. When he formally retired the honor was left open to competition and was contested by "Tom" Spring and "Bill" Neat as the two most promising candidates. Spring capped a long uphill career by winning handily in eight rounds. 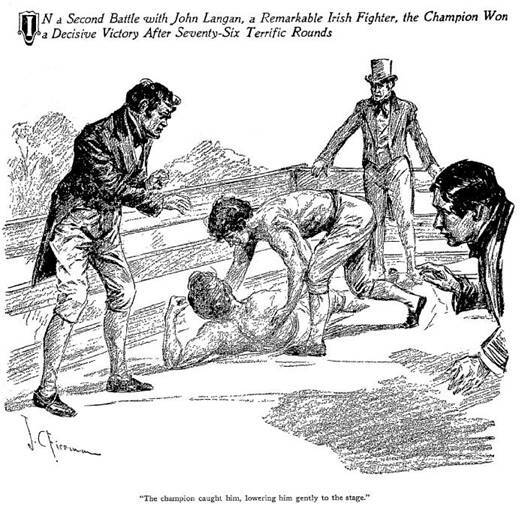 A new challenger was found in the person of John Langan, a courageous Irishman who held the title for his own country. Spring defeated him at Worcester in the presence of 50,000 spectators after a fight of seventy-seven rounds, which was marred by constant interference from the crowd. The result was so unsatisfactory and Langan represented so forcibly that he had not had fair play that another meeting was arranged. If there was a London fight follower who was not on the road to Chichester or already In the vicinity of that city by early morning of June 8. 1824, he had set up as a hermit and a lone dweller from his people. Those who had witnessed the first meeting between Smith and Langan, who were this day to submit once more to the issue of battle, knew that the prize ring could show no better sport than what lay forward. It was Ireland against England, and the better man to be champion of the world. "Tom" Spring, the champion, whose real name was Thomas Winter, was twenty-nine years old and the veteran of a score of desperate encounters in which he had proved that persistence and courage may outweigh a lack of natural aptitude for athletic success. A bull dog tenacity and an inability to yield any fight while he could stand had brought him through with but one defeat, that at the hands of "Ned" Fainter, before he attained the title. John Langan, the challenger, was a fearless. generous, scientific boxer in his twenty-sixth year. Born In Clondalton, county Kildare, he had won his way through the ranks of the Irish fighters to a point where none dared accept his open offer to dispute the title he had assumed. After having served with honor in a military expedition to South America he had come to England with further triumphs in view to receive his first check from Spring. Chichester was humming like a hustings at dawn. Hewlings, mine host of the Swan Inn, had become the pioneer magnate of the ring by taking upon himself all arrangements for the fight. he had purchased this privilege for £100 paid to each of the gladiators, selecting an open field about three miles out of town as the scene of action. The field was cut off by a canal spanned by a single bridge, and it was here that the far sighted promoter designed to reap his harvest in contravention of slack custom, which permitted any outsider to enjoy a combat if he could but squeeze near enough. Within the field farmers of the neighborhood had drawn up their carts and wagons to form an outer ring about the stage. In accordance with the article of agreement particularly demanded by Langan the twenty-four foot stage had been built six feet from the ground and planked with three inch deal without turf. He had held this as his right, since in the previous contest the crowd had swarmed up and over at pleasure. In place of the usual ropes three rows of rails surrounded the platform, which, with the posts, were smoothed and rounded to prevent Injury. At eleven o'clock the throngs began moving across Hewlings' bridge to the field, and two hours later Mr.Jackson, the former champion, who acted as marshal of the day ordered that the lists be opened. Spring, guarded on one side by his backer, Mr. Sant, and on the other by a Baronet, wedged through the press at the heels of Cribb and Painter, respectively his second and bottle holder. Cribb had ever been Spring' s chief supporter and admirer, and his presence now in attendance upon "his boy" aroused a storm of applause. The champion tossed his hat over the rails to the stage, a traditional gesture of defiance, and climbed the ladder nimbly. While he stripped Cribb and Painter strapped on kneecaps of padded leather, it having been charged that during the former meeting they had sought secretly to injure Langan after a fall. Langan arrived a few minutes later, accompanied by Colonel O'Neil, his backer, "Tom" Belcher as his second and "Big" O'Neal as his bottle holder. He ascended the stage and modestly dropped his hat over the rails, then untied a black silk neckerchief and affixed it to one of the posts as his display o£ colors. Spring intertwined a blue scarf with Langan's as his own gage of battle, a circumstance which moved the fancy to heavy witticisms about the juxtaposition of black and blue. There had been a dispute at the first meeting of the men as to the weight of the belts worn. and Spring, stepping forward, showed Langan that he had no belt about him on this occasion. Langan thanked him and demonstrated that he was equally without protective leather. A moment later time was called and they advanced to the salute, Cribb at the same, time shaking hands with Belcher and Painter with' O'Neal. The attendants then retired and the boxers fell on guard. Spring was in his best form. – weighing 186 pounds, and trained well but not too closely. .Langan weighed about ten pounds less and was nearly two inches under the other's height of five feet eleven and a half inches. The Irishman was magnificently developed as to chest and arms, though a trifle too slender in the legs and about the loins. Both men came to combat smiling and eager. There was no undercurrent of ill will between them. Each knew his adversary for a fair, high spirited fighter, ready to do his utmost but above taking undue advantage. Spring's attitude was with body and head well back, balanced upon his rear foot. Langan's tendency was to hold his head rather low and forward. They stood a moment while each caught and held the glint of his opponent's eyes, then they circled,watching cautiously for the lead. A little light sparring was Quickened when Langan drove for the face, Spring stopping neatly and countering with a swing which got home on Langan's head. The Irishman bored in quickly, reaching for the wind, and Spring rushed to grips. The struggle was a plain trial of strength, not complicated with wrestling tricks. The champion was forcing his adversary back when Langan dexterously broke away and slammed in with right and left, which Spring guarded. The champion wasted no lime in feints, but suddenly struck a fast pace and they milled fiercely, Spring planting a hard facer. Langan found the distance unprofitable .and again sought to bore in to close quarters where he could hammer the ribs. Spring met him the same way as before, clinching and struggling for a throw. as they tramped and whirled Langan slipped to his knees. Spring patted him on the shoulder approvingly and they went to their corners. Langan had warmed into his style and opened the second round with slashing tactics, sweeping a left hook to the jaw and hammering Spring's guard. The champion showed himself nimble footed and evaded a terrific drive, stopping the rush with neat parries and clipping in to the head. They mixed It freely, taking punishment on both sides. Spring's guard was excellent and be was remarkably fast. He had a little the best of the milling and Langan, bobbed with a driving left hander, danced out of the melee . Spring followed, but both were cautious and winded. They sparred for some minutes, when Langan stepped in and broke an opening through which he shot a hard right to the mouth. Spring gave ground and the Irishman tried to repeat, but the champion, smiling, warded easily and they came to short arm, driving jolts to the body. Langan found this expensive and closed. They struggled desperately, when the Irishman by clever shifting of his weight hurled the other backward to the boards and fell upon him. A sweeping cheer from Langan's partisans greeted the turn of fortune, but the odds of two to one on the champion remained unchanged. This slight advantage was just what Langan had needed. Though no braver boxer ever mounted a stage, he was apt to yield to discouragement in the face of continued failure and a dash of success was a tonic to him in action. He left his second's knee cheerfully at the opening of the third round and walked snappily into the first rally. He slid a clever swing over Spring's guard, but the champion jumped aside and they joined for a hot mill that showed the spectators some of the prettiest work of the flight. The guard of both seemed impregnable and it was hit, ward, counter and hit with the precision of clockwork. Langan suddenly shifted and slammed through a drive to the ribs that made trouble, but the champion fought him to a pause without giving ground. Spring now went upon the aggressive, ripped home a blow to the jaw and drove the Irishman into a corner , following hard. Langan fought out cleverly with body blows, parrying a swing that bid fair to demolish him with a skill that set the throng cheering. Bracing for retaliation, he feinted to the head and flung himself forward with a haymaker at the ribs that Spring was just able to stop. Langan held stubbornly to his advance and peppered Spring's guard, launching a tremendous drive at the face. The champion ducked In time and danced away from the determined Irishman. Langan went after him again and kept the champion footing it merrily and dodging swings until, cornered In his turn, he came out manfully. He smashed a Terrific clip with the left to the face that sent Langan spinning, followed it with another and a third to the same spot, and .reversed the situation. Langan again retreating to the corner. The Irishman rallied and they fought to a standstill. Langan started again, but the champion got his dangerous left to the face once more and on the retreat the Irishman closed. After a brief struggle Spring threw his man, ending a round of nearly seven minutes amid deafening applause. Langan had suffered severely about the face but had not lost heart. He felt that he had firmly withstood the worst Spring could deliver and that his returns did not lack effect. The half minute treatment from Belcher and O'Neal freshened him greatly and he jumped into the fourth round in whirlwind manner.Spring was slow in defence for an instant and the, Irishman pounded two to the ribs and one to the ear that drew crimson. He held to his pace, fighting with the agility of his weight and hammering the champion once and again to the jaw. Spring gave before the slashing Irishman, but calmed him with a flush hit to the mouth. They mixed it at high speed, when Langan closed and putting forth, all his strength threw the champion, landing on top. Langan's left ear was in bad shape from a clip received in the last mix up when he sat upon his second's knee once more. He was also badly winded, but the short respite sent him back to the scratch again with untamed vigour .he led of the fifth round as he had the preceding, putting all his weight behind right and left drives in sledge hammer style. Spring needed all his science to break the force of the Irishman's attack, but refused to retreat and they stood up to it as the forefathers of the ring were wont, take one and give one, and once again. Langan showed well in such straightforward tactics and after taking a terrific drive to the chest found Spring's claret with a flush hit to the face. The round presented little in the way of shifty play and both were seemingly reckless, set upon landing a decisive blow. In a fast, hard mill Langan put away several of Spring's best efforts, but finally caught one of the champion's dangerous swings on the side of the jaw and tottered. Spring sent him down with a face smash. The Irishman had had enough of aggression for a time and lay back when they stepped into a sparring bout in the sixth round. Spring was calm and unruffled. The best point about his generalship had always been that he did not rely upon any set method of offence or defence. Not being what is known as a "natural fighter,'' he had no pet blows, no favored style. he governed himself entirely by the character of his opponent's fighting and was the master of all ring tactics. A long, laborious training had bared every trick to him and taught him to rely upon none. So it was that when Langan tried to force the pace the champion forced as hard, always seeking to keep just a trifle ahead, and now that Langan grew wary Spring was equally ready to relax. They exchanged a few blows and Langan danced out of range. Spring quickly closed and threw him. landing on top. Langan was fresher for the seventh round and led off strong, setting home a handy tap to the side of the head. Spring stopped another nasty swing with a precision that brought applause, the approbation swinging to the Irishman an instant later when he foiled a ripping drive for the body with equal skill. They came in at short range and fought to a standstill. In a lull Belcher shouted advice to Langan. "Fight first," he called: "fight first, he can't hurt you.'' "Gammon him to that if you can." retorted Cribb for the benefit of his man. The Irishman went upon the offensive in obedience to the injunction and planted a telling cut below the champion's left eye. Spring wadded another at the same spot and came through with a smash to the face, Langan footing It away just in time to avoid its mate. They mixed fiercely. Spring jolting home his left with great regularity to the ribs. Langan was suffering and tried for the Jaw but the champion slammed thrice to the head and drove his man clean away. Langan was on his mettle and started a volley at the face that bathed Spring in crimson. Then, at a good opening, he put himself behind a tremendous blow that almost wrenched him off his feet -when Spring hopped out lightly. The Irishman gamely tried to hold his speed, but was plainly weakened, missing several wild swings. Spring closed, but Langan threw him off desperately, cutting the champion's head. Spring came into a wrestle again and whirled his man off his balance, landing neatly over the ear while the Irishman was falling. The battle seemed to be Spring's at this stage and his partisans were confident that the end was near. but in this they were not counting upon Langan's reserves of courage the Irishman had tasted victory in the fierce early rounds and was heartened to his task. He would not give in now until he was crushed. The eighth, ninth and tenth rounds were brief and tame. Although Langan showed no disposition to quit he was cleverly fighting for strength. Spring saw it, but, in accordance with his invariable plan, would not pull up a notch. If Langan was resting, so was he, and the big, quiet, kindly fellow held off and bided his time. In the eighth and ninth rounds the champion got his man down, but in the tenth the Irishman, in response to a word of advice from O'Neal, gave ,Spring a clean back fall, taking a swing to the head. At the opening of the eleventh round it was plain that Langan was getting his second wind. He opened with a bothersome drive to the ribs and Spring instantly closed, throwing and landing on top In the twelfth round they feinted a little, when the champion again closed. The Irishman crooked him neatly. and in falling Spring received a nasty cut on the head by hitting a rail. Langan began to rush in the thirteenth round, but Spring evaded and got home a solid body blow, following into grips and again landing on top. Spring's followers began to show uneasiness. The champion had certainly been unwise in slacking the Pace and in seeking to close so often. The wrestle was the recourse of the man who had suffered most and wished to bring the round to a close, and was, moreover, a tiring maneuver. But Spring had reasons of his own for these frequent falls. His left hand, injured in earlier fights, had played the traitor. At the instant of receiving the back fall in the tenth round he had struck Langan on the head from an awkward angle and the ligaments had been torn. His fist was now swollen and puffed up like a blister. He nursed it, closing and throwing his man again for the fourteenth round. Langan bored in hard at the fifteenth round and hooked through with left and right, the first doing damage. Spring closed again and threw his man. cutting him over the head as he went down. The sixteenth round was scarcely more than a feint and a fall, the fighters going down together. Langan patted Spring's shoulder as they were rising and they exchanged a few friendly words. The champion skillfully stopped a dangerous rush in the next round by quick play with his right, using his left arm only to guard, but the Irishman made a perfect hold and threw the champion a terrific cross buttock that sent Spring hurtling through the air to strike the stage heavily. In the eighteenth round Langan got home two telling drives before they went down and in the nineteenth he swept in a swing that had venom behind it. though Spring threw him. The change in the situation was now apparent. The Irishman was fresher at the forty-five minutes than he had been at the ten. Spring's left hand seemed to be useless and he was keeping it out of harm's way.His right was also giving him trouble and the frequent wrestling had sapped his strength. Neither man had forgotten to smile and the spectators could see a long fight ahead. What with Langan's spurt and the champion's injuries the issue seemed almost exactly balanced. Langan opened the twentieth round in whirlwind style, but the other blocked him cleverly and catching the Irishman hurled him over his thigh. Langan struck on his head and Spring, falling by his own efforts, landed on top of him. For a moment it looked like a "settler," but the Irishman was up quickly. The champion ended the next six rounds by throwing Langan, but the Irishman came up each time as if nothing had happened. Spring's tactics were now generally understood and applauded. His right hand was nearly as bad as his left and, with accustomed caution, he was giving away not a single chance. Secure in his own strength, he counted upon the falls to weaken his opponent while saving his fists for the vital moments. In the twenty-seventh round Langan slipped to the floor and the umpire warned Belcher that his man must not go down without a blow. Langan would have remonstrated at opening the twenty-eighth round, but was sharply called to the scratch by Cribb. They milled and closed, when Spring again won the fall. The Irishman courted trouble in the next session and came slashing in with a right hand swing that sliced the champion's cheek. Spring found the opening he wanted and shot over a flush hit to the mouth with his right that sent Langan staggering. The champion then leaped upon his adversary and throw him. “That’s a little one for us I believe.Our hands are gone are they ?. Langan was now proving himself one of the gamest men that ever entered a ring. Hammered, pounded and jarred almost out-of his senses, cut and torn and welted beyond human semblance, he still tripped it jauntily to the centre for more. .Spring was settled into a dogged stride, warily nursing his hands the while. The Irishman was all for fighting at distance, but the champion could not afford to meet him at this and held to his wrestling. In the thirtieth round Langan again turned the tables by winning the fall. In the next Spring caught him a humming right hander to the jaw. Langan came back with a stiff body blow, but swung wild three times until the champion sent him down with a lunge under the ear. The thirty second round ended with a heavy fall for the Irishman that seemed to have finished him. He came up groggy and rested heavily on Belcher's knee. Spring now proved once more that he was an eminently fair fighter, generous to the point of endangering his own-chances. Langan was heaving from the last-fall when he came up again, and after some weak blows the champion caught him, lowering him gently to the stage. The respite proved most valuable for Langan. He returned to give battle with renewed strength for the thirty-fourth round and drove right and left ,to the body. Spring retreated and the Irishman slashed in viciously, only stopping when thrown One hour and seven minutes had now elapsed. "You're not hurt yet. Jack, and Spring's hands are too far gone to hurt you now." Langan grinned. "Never fear." he said: "I'll win it yet." It seemed as if he might when he rushed Into the thirty-seventh round, but Spring stopped his rushes neatly and was much freer with his fists, punishing Langan about the face and ribs and throwing him.Belcher had almost to carry his man to the center for the thirty-eighth round, but once placed the Irishman fought like a wildcat until Spring got home four blows without return and threw him. The champion won the next six sessions on falls, but the Irishman, to the surprise of all still had business in the field of fight" and seemed the stronger for his frequent forcible contact with the stage. In the forty-fifth round he sent in a ripping blow to the body and slammed the champion from his stand, following with a pretty swing to the side of the head Spring came back, but the Irishman stood him off and the champion had recourse to wrestling once more, when, as usual, his greater weight won the fall. Langan took a little brandy and water in the interval Langan seemed absolutely unconquerable. He sustained Severe injuries in the next three rounds, but was up to the mark for the fiftieth. "Is there anything the matter with that hand, I should like to know?" 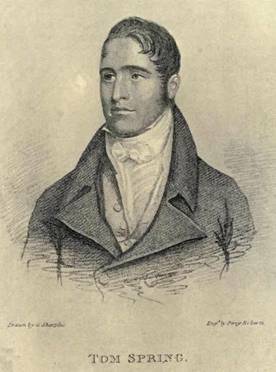 In the fifty-fourth round Langan caused wild enthusiasm among his friends by making a rattling rally and closing so hardily that Spring was thrown with great violence. There seemed to be no end to the Irishman's resources and two more reverses did not quiet him. He opened the fifty-seventh round with a burst of energy and for some minutes was ail over Spring, who was holding himself together and playing with extreme care. It was well recognized at this point that a lucky throw on the part of Langan might switch the battle to his side, since the champion's hands were like pillows. The Irishman cut in a tremendous smash to the side of the head and under Belcher's urging tried to repeat. But the champion saved himself further damage by hasty footwork and came back strong with right and left, under which Langan staggered and fell. Langan was almost pushed down in the next two encounters, but he had more surprises in reserve. Rallying in the sixtieth round he whipped a stinging right to the face, closed and hurled the champion to the stage. Langan's game and resolution brought him a continual roar of applause. He was not yet beaten. With any one but the cool headed ring general opposite him at this moment he would almost certainly have won. "I never saw such a fellow," exclaimed "Jack" Randall, "the Nonpareil;" "he'll fight for a week. He don't know when to leave off." So it was. Langan showed pure grit and took heavy falls in the next four rounds. He came up for the sixty-fifth round with wavering knees, but still willing. The champion was in little better case.Spring could scarcely close his puffed hands and was very weak. The Irishman meant fight again and whirled several taps to the face, punctuated by a hard drive. Spring gave ground, but used the back of his fists to advantage. Langan raised another storm of cheers by closing, shaking the champion of his feet . He held his own in the next two rounds, though making each move with obvious effort Spring hit him down open handed in the sixty-eighth round, and as the Irishman rested on his second s knee there were cries of "Take him away!" "Take him out!" "Do you hear what they say, Jack?" asked Belcher. "Yes." said Langan. "But I'll not be taken away. I'm winning, man." For the next five rounds Langan opened each time in undaunted manner, but his strength could not carry him beyond a few weak blows. It was evident now that he would not quit as long as he retained consciousness in spite of repeated cries from his friends. Spring, no longer in danger, grew fresher, but exhibited his usual generosity, refraining from punishment and contenting himself with stopping the Irishman's rushes and pushing him off his feet. After the seventy-fourth round, in which Langan stood but a few seconds, Cribb joined In urging him to quit. "I will fight," returned Langan. "No one shall take me away." Cribb appealed to Belcher, but the veteran was helpless. Langan had made him promise that he would not take that decision upon himself. The Irishman was carried to the centre again for the seventy-fifth round, making desperate efforts to control his racked limbs and place himself in a posture for defence. Spring went up to him and rallied easily with him, then fibbed him down. Once more, for the last time, he came back, stauch to the end. His knees almost gave way beneath him when Belcher's arm was removed. He stood for a second, trying to lift his hands when Spring came up and sent him down mercifully, without punishment. When his attendants reached his side he was unconscious. The crowd acclaimed the champion, but Spring had no eyes for any but his gallant adversary. He walked over to the fallen man, stooped and caught his hand. Langan opened his eyes, "Is it over?" asked the Irishman. "Yes," said Belcher, and Langan fell back with a sigh.